The grass is growing, the birds are chirping outside, and our hoophouse walls are having to be opened each morning and closed each night. Spring has definitely sprung at Finding Eminence Farm. Our “high tech” seed starting setup is full of tiny new plants in our commercial seed starting facility, which we sometimes refer to as “the basement.” The hoophouse is starting to pump out spring blooms of anemones and angelique tulips, with ranunculus and sweet peas soon to follow. We’re still in the calm before the storm, but only for a few more days. I was on spring break last week from my job as a teacher, so we decided to use the opportunity to zip down to Florida for a few days to stay with some of Audra’s family and enjoy some warm weather and sandy beaches. To be honest, I was initially reluctant to go. This time of year, I am chomping at the bit to get back out there and grow some stuff, and I had plenty of things I could have gotten done while we were down there. Audra was adamant, though, that we take some time for us. I’m so very glad that she persisted. The trip was brief, but it was exactly what we needed. We spent a few days at Cocoa Beach, went to a zoo, took a short air boat ride to see some gators, and hung out at Audra’s uncle’s 10-acre farm. And Lincoln had many firsts: first airplane ride, first salt water up his nose, first boat ride, first time seeing alligators, first time eating alligator, first time eating crab (which he liked even more than the alligator), and maybe a few other firsts as well. It was a simple, scrappy, and fairly inexpensive vacation–just the kind we like. And now we’re back and ready to crush it. Our new two-wheel tractor, a BCS 749, arrived right before we left. I cannot wait to get this thing going. If you aren’t familiar with a BCS, look it up. You’ll want to be a market farmer too, just so you get to use one of these brilliant machines. It’s the best thing to come out of Italy since…pizza pie. Though, to be fair, I think pizza might have been an American thing that is just pretending to be Italian, but I really have no idea. Don’t quote me on that. But DO go enjoy some pizza because it’s delightful, regardless of where it came from. Yesterday we “potted up” a bunch of transplants that we ordered. Basically, this just means that we transferred the teeny tiny plants into slightly bigger containers so they can continue to grow before we get them out into the field. I also set up our mini-hoophouse inside of our actual hoophouse. I should take a moment and explain the story of this tiny structure. I bought this 4 x 8 hoophouse on clearance at Menards maybe eight or nine years ago. They had it marked for $40, which I am convinced was a mistake, but regardless I bought it before they could change their minds. I used this for years at our house in town to start seeds and grow out transplants before putting them into our postage stamp size garden. Our first year on the farm, this was our only covered structure in the spring, so we filled it with plants and then had to carry flat after flat after flat into the house every night there was a change of frost. Now, we set it up for a short period of time inside our hoophouse to transition our tiny seedlings to the field, and it allows us to provide some supplemental heat to plants that need it on these cold spring nights. It’s perhaps the smartest $40 I have ever spent. Except for that $40 I paid for Audra’s wedding ring from that guy in the van in that alley. We’re kicking it into high gear here. 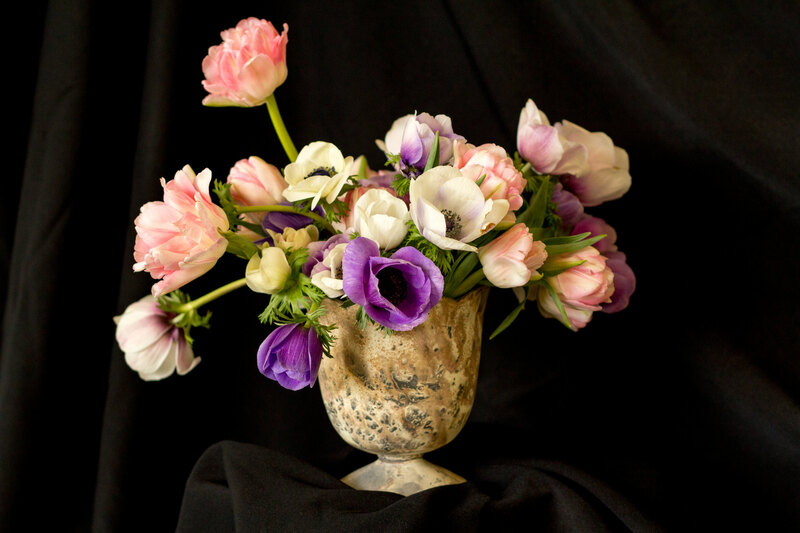 We currently have angelique tulip bouquets available for a short period of time for either farm pick-up or delivery. This week we will also be announcing a series of classes offered at the farm this summer. As always, our mailing list gets first dibs, so sign up below if you’re interested in being the first to know. Thanks for continuing to follow our story. We promise to keep it weird here on our little carved out chunk of the inter-webs.